Accidentally deleting photos from an iPhone or iPad happens and it’s not a fun feeling to know that you may have lost a photo or group of images you wanted to keep. Fortunately the latest versions of iOS support an automatic recovery process that allow you to restore deleted pictures, directly from your iPhone, iPad, or iPod touch. The photo recovery feature is fairly forgiving, giving you a reasonable timeline where restoring a lost picture is possible. I Accidentally Deleted a Photo / Video From My iPhone, Can This Help Me Recover It? Yes, almost certainly! One of the intentions of this easy photo and video recovery feature is so that it enables things like this. If you accidentally deleted a photo or video from an iPhone (or iPad) then you should try to recover the deleted photo this way, it will likely work for many scenarios. Be aware that this feature is for newer devices, and the iPhone, iPad, or iPod touch must be running iOS 8 or newer for this feature to exist on your device (most new iOS devices are running iOS 12 or later right now so this isn’t much of a concern). That means any new phone or purchase will have the feature, but older ones may not. So if you or a loved one accidentally deletes an important picture or even 100 of them, you can recover them easily and without hassle. 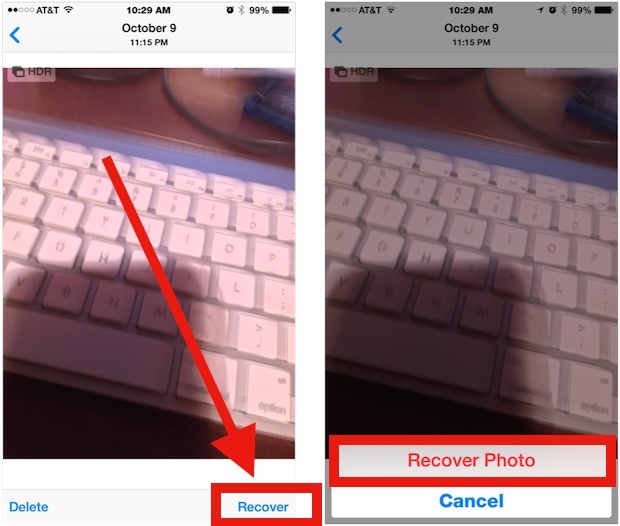 There are a few exceptions to the recover feature working, with the most obvious being that if a picture was permanently deleted through the “Recently Deleted” album, a picture or video extended beyond the recovery period (typically 30 days), or if the iPhone or iPad has no available storage space left. 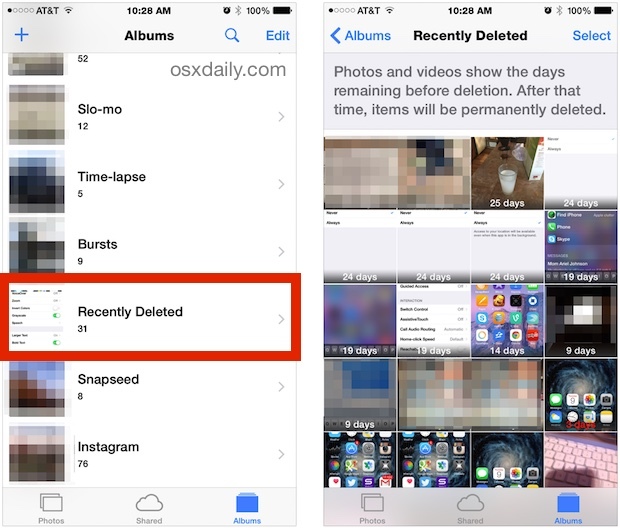 Did this work for you to store a deleted picture or video? Or do you know of any helpful methods to recover a deleted photo or video from an iPhone or iPad? Share with us in the comments below! Your last mailing that I received today is about recovering deleted photos on an iPhone. My problem is that I cannot delete photos on my iPhone 5 (OS 8.1). All those photos that were on my desktop Macbook Pro have been deleted but they are still on my iPhone and I absolutely cannot delete them. I am even prepared to delete ALL photos on my iPhone if that would solve the problem. Any suggestion? Thank you in advance for your help. Fire it up again, counter-intuitively this will delete all your photos except the camera roll. Reboot iPhone, press and hold BOTH buttons until white apple logo appears and release buttons at this point. Wait for restart and check photo app, you should only see your photo roll. Worked for me, twice in fact, as 8.1 update reinstated this “feature”. There may be other permutations of this and it is very easy to switch it on accidently. Not, IMHO, one of Apples’ better features. Since upgrading my iPhone 5 to iOS 8 I’ve noticed a few bugs… my events are no longer in alphabetical order (as they were and are in iPhoto on my iMac – from where I sync), the orientation auto-detect seems to get stuck and deleting photos seems to have a lag between the time I press delete and the moment the picture actually disappears. I didn’t realize this last one was an issue at all and had accidentally deleted a picture I absolutely wanted back (a selfie with a much loved pet from a few weeks back, accidentally deleted, and he passed on unexpectedly). When I went looking for the image it was gone and I suddenly knew why. But what I didn’t know was that iOS 8 included this image recovery option. Imagine my excitement and relief when I came across the feature and found this now priceless photo…. Very glad to hear you got the important photo of your pet back, and sorry about your loss. I accidentally deleted a bunch of photos that were in my “recently deleted” album. Is there any possible way of me getting these pictures back somehow? You can restore from an iPhone backup which has the pictures, that’s the only way to recover photos from ones you removed from the deleted section. No that will not work but you could restore from a backup you made before you deleted the pictures, the old backup would contain the old pictures, but not any new pictures. I have erased my photos from Photo album/recovery photo. I thought it’s backup in my computer but unfortunately its not saved.. I lost all my important pictures. Please help me if i can recover my removed photos again in Iphone 6. I accidently deleted mine from recently deleted can you please help me get that one back? iPhone 5s – my recently deleted folder for photos/ video so now while I delete I don’t have that folder to “empty” to free up the space on my phone? How do I get this recently deleted folder back? use iCloud backup to recover it. I deleted a photos and videos, also in recently deleted album. I don’t have the back up. Then after deleted my photos and videos, I reset my iphone. Is there any way to recover it? by the way I’m using iphone 6s. thank you. I bring my iPhone to the apple store and they noticed that there’s a hardware problem. After 3 days I receive an update from Apple Store and they said that it is already for replacement. I deleted my private files before I give to them. I just want to ask if they will still recover my files? Like contacts, pictures, videos and memo?. thank you. please notice me! need help.. I bring my iPhone to Power Mac Center and they noticed that there’s a hardware problem. After 3 days I receive an update from Apple Store and they said that it is already for replacement. I deleted my private files before I give to them. I just want to ask if they will still recover my files? Like contacts, pictures, videos and memo?. thank you. please notice me! need help..
How do you recover a photo deleted from a message attachment t? Help! I took some videos a few days ago. When looking through my pictures, some looked totally white so I deleted them. I think I could have saved them. How do I get them back? You saved my life today. Recovered important videos from field trip. Many people would recover lost iphone data from iTunes backup or iCloud, but if you did not backcup any data from your iphone, you need a data recovery program, which can recover lost data easily. Have a try of MobiKin Doctor for iOS.